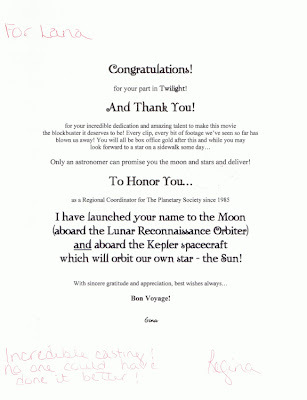 As Larry Carroll reports on the MTV Movies Blog, several of the cast and crew of “Twilight” have had their names launched to the Moon and into orbit around the Sun. 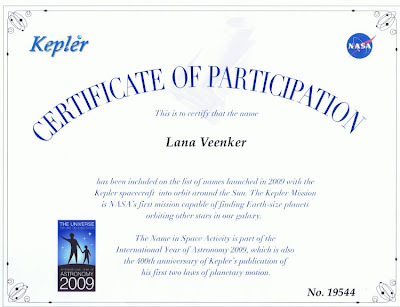 Uncannily, Lana received her Certificates of Participation in NASA’s Kepler Mission and Lunar Reconnaissance Orbiter Mission on her birthday. She was…speechless! Thanks, Regina! 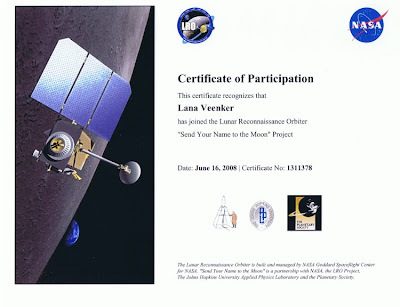 We’re getting them framed!